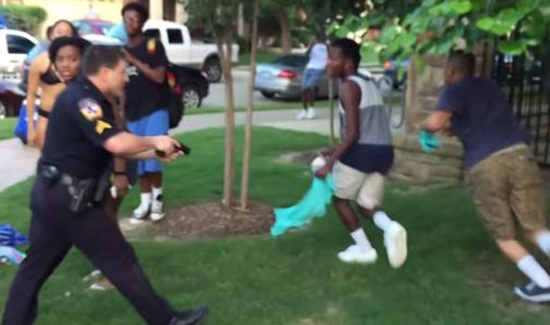 An officer in McKinney, Texas, dashes down a sidewalk, losing his flashlight as he runs past a teenage videographer toward an emergency. Seconds later, the teen with the camera walks up to another officer, one who is standing with a group of kids. “I’m just saying,” the officer is saying in a calm, corrective tone that parents and school teachers everywhere will recognize. He thanks the videographer for returning the flashlight, then listens for a few seconds as the kids around him try to explain who was and was not involved in a prior incident. “Okay, guys, I appreciate that,” the as-yet-unidentified officer says. He responds to their concerns—that the police had detained the wrong people—by saying, “Okay, that’s what I’m saying. They’re free to go.” While not casual, the officer is composed. His tone is friendly and professional as he engages with the kids.